As you can see from the label on the jar above (My little fruit doodles. 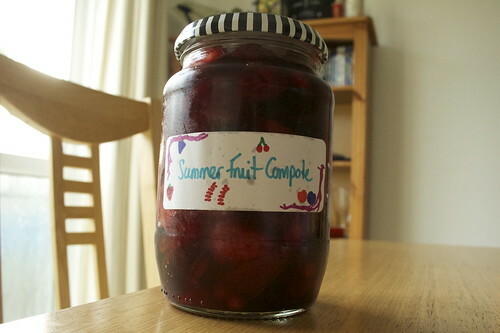 I can’t draw, I know), I originally called this a summer fruit compote. But then I wrote my What’s In Season: September post and realised that every fruit I used in it is in season this month, so it got a re-brand. But I’ve polished off the compote by now so couldn’t take a new photo. Oh, well. Anyway. This is an interesting recipe. You make it by cutting up loads of fruit and bunging them in an oven. It comes out smelling so good I wanted to bury my face in it. Once it’s made you can use it for all sorts of things — in a crumble, on toast or crumpets, with yogurt or with ice-cream, whatever you like. If you’re on Slimming World, this works out at about 3 Syns for a sixth, which is a pretty hefty portion of fruit. It’s based on a recipe by The Hairy Bikers, and is my new favourite topping for my cereal. I’m wondering if I can make something similar when it comes to winter, using rhubarb or something. This is so nice I don’t really want to give it up when the fruits are out of season. Maybe I should substitute frozen fruit…something to think about. Anyway, let me know how you get on! How would you eat your compote? I think it’s definitely worth the three syns! All it needs is a bit of 0% greek yoghurt. What if to make it a bit more decadent (well, 2 more syns!) add in a cadburys highlights into the yoghurt?